Alright, it's about time that I do this post for two products I received from John @ Misikko.com. First off, Misikko is a lovely, family-owned hair care site. They specialize in flat irons, but are not limited to just those styling tools. They also sell hair dryers, curling irons, makeup and skincare products, and of course hair care products. John emailed me about a month ago and asked if I would like to receive two products to do a review on. Of course I said yes, are you kidding me? "Hana Shine Shield is the latest product in a line committed to safe, effective heat styling. Shine Shield is a thermal serum that can be used as a leave-in conditioner - lightweight and never greasy, it protects and strengthens hair whether you use it with a flat iron, hair dryer or alone. Shine Shield contains the natural magic of Jojoba oil for its superb qualities of deep moisturization, fast absorption into hair follicles and scalp, and unparalleled shimmer & shine. 6 oz." * This is one of the top selling hair care products, and I do understand why. My hair is pretty thick and this product worked very well by itself and with others when it came to straightening my hair. It gives a silky, smooth, shiny finish to my hair and leaves it feeling nice and soft. I like how no matter how much product I use, it never feels greasy and yucky. I use it prior to all heat styling and for smoothing down those annoying fly-aways. I use a Sephora flat-iron which heats up to 410 degrees. Irons that heat up to 425-500 degrees could really get some great use out of this product. 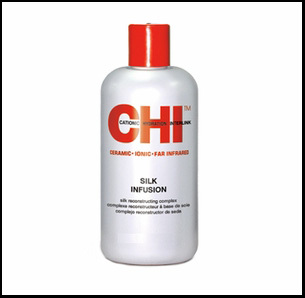 "CHI Silk Infusion™ - Reconstructing Complex is specially formulated for thermal styling and hair repair. CHI Silk Infusion contains no alcohol, so it won't dry your hair out as a leave in treatment - and it'll leave your hair with the head-turning, lustrous shine of pure silk." * I honestly think that this product is beyond overrated. It wasn't very thick, but it felt gunky when I applied to my hair, even in small amounts. I used it on my cousin's as well and it made her hair feel somewhat "dirty" while styling. However, I heat my curling iron up to 500 degrees for tight waves and it worked well for that. But for my flat iron, I could pass on using it again. I found it to be very messy as well. I didn't realize I had knocked it over with the top open, and it took me forever to clean up the yellow stain off my bathroom floor. Have you tried either of these products? What do you think of them? Great post have to checkit out! well i don't own a super fancy flat iron like a chi or anything, just a simple one from sephora. but you could be right. i just use it as a shine serum now for my curls, nothing else.